Finally, the girl you have liked for a while just started noticing you. You pass her by in the hallway -- all flustered and nervous -- and she tilts her head away from her friends to give you a smile. She actually says hello when she sits next to you in class and when you see her alone at times, you strike up a brief conversation. All the signs look favourable. Everyone you have talked to -- friends, parents and even your bullying older brother -- encourages you to man up and ask her out already. However, you need a plan. You need to ask her out in the most creative, cool and romantic way to ensure that she will give you an ecstatic "Yes." Ask out your girl in the most romantic way. If you draw well, sketch a picture of your girl. Try to draw her from your point of view, such as a side shot of her sitting next to you in class or her standing by the lockers waiting for her friends. Put as much detail in the picture as possible, such as the pleated skirt she wears and her high ponytail. Not only will you impress her with your artistic talent, but she will appreciate your attention to detail. When you hand her the picture, send her a sweet message by telling her how she is so much more beautiful than a picture could ever express, and that you would love to be in the picture with her someday. "Will you be my girlfriend?" has five words in it. That makes one word for each school day. Starting with Monday, slip her a note nonchalantly in class every day of the week, each of them containing a word from "will you be my girlfriend?" So on Monday, write "will." On Tuesday, write "you," Wednesday write "be" and so on. By the end of the week, she'll get the idea. 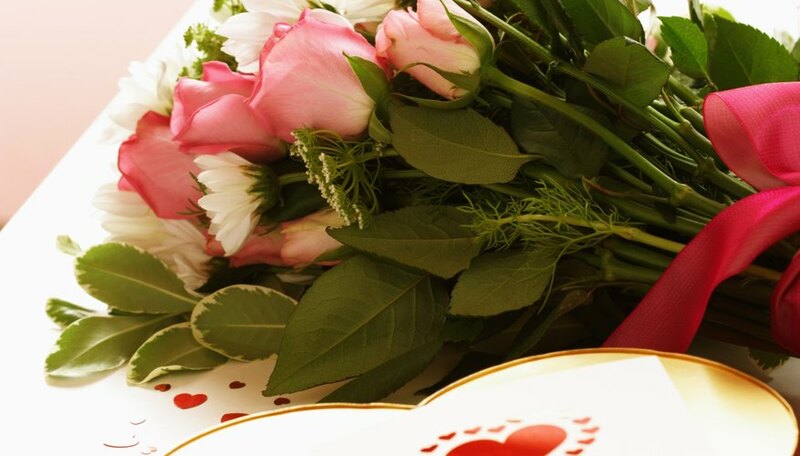 Though traditional, flowers and chocolate still are a romantic way to ask a girl out. From your local florist, find a dozen of the prettiest roses and a box of the most decadent chocolate. Have them delivered to your girl during the day, with a note attached that doesn't reveal who they are from. However, in the note, tell her that if she wants to find out who her secret admirer is, she should meet you alone at a safe and public place nearby after school. Keep your girl excited all day with suspense, and finally surprise her at your meet-up spot and ask her out. If you have observed your girl closely, you know her hobbies and interests. Find a few small presents related to her hobbies and interests to show her you have been mindful. For example, if she expressed enthusiasm over a particular band, get her one of the band's albums. If she enjoys watching Japanese anime, give her a set of comic books of her favourite anime show. You don't need to spend a large amount of money for these small gifts. The point is to show her you have paid attention to her. If she appears touched by your gesture, ask her out. Triston Liu started her freelancing career in 2010. She is currently the entertainment contributor and the beauty contributor for an online publication. She has a Bachelor of Science in information systems from Missouri S&T University. Liu, Triston. "Ways to ask a girl to be your girlfriend." Dating Tips - Match.com, https://datingtips.match.com/ways-ask-girl-girlfriend-8178247.html. 09 June 2015.